Also available as paperback and e-book through Amazon. 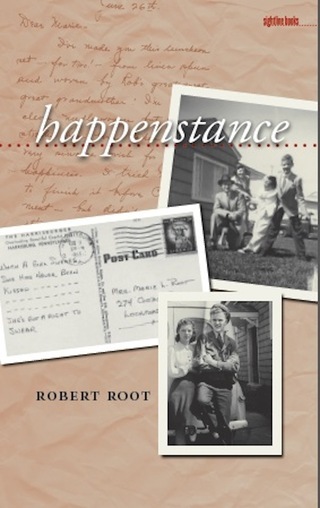 Reflecting on how a student’s parents met because of a fly ball to center field in a summer softball game, author Robert Root wondered how the lives of that student’s parents and of the student himself would have changed had the batter bunted or struck out. Haunted by this pure example of happenstance, he began to ponder his own existence, dependent in part on geology (the Niagara Escarpment) and history (the Erie Canal). He wondered how happenstance had influenced the course of his parents’ lives, in particular their marriages (they married and divorced each other twice), and consequently the shaping of his identity. Happenstance investigates the effects of that phenomenon and choice on one man’s life. Root explores this theme in interwoven strands of narrative, interpretation, and reflection. One strand, “The Hundred Days,” follows his attempt to write one hundred journal entries, each about a different day in his life, to recover memories of specific moments or collections of moments. In the strand headed “Album,” he examines and interprets old family photographs in light of the way he reads them in the present, as someone now privy to a family secret that directed his and his siblings’ lives without their knowledge. Interspersed among these brief interpretations and narratives are reflections on happenstance and choice, a sequence contemplating their effect on his life and perhaps on all our lives. Through juxtaposition and accumulation, the book’s incremental unraveling of meaning imitates the process of unexpected epiphanies and gradual self-discovery in anyone’s life. By revisiting individual days, giving voice to photographs that mutely preserve family moments, and reflecting on the way happenstance and choice determine the directions lives take, Robert Root generates a meditation on identity anchored in an album in words and images of a mid-twentieth-century life.